Where did the name, Cold Weather Company come from? As soon as we started getting serious about writing and playing out, we knew we needed a name that would capture something about us. The brainstorming was a three-week-long process that basically consisted of countless group texts and whiteboards full of rejected names. We eventually landed on Cold Water Canvas, and from there moved to Cold Weather Company. The three of us generally find the most inspiration for songwriting during the winter months, so “cold weather” seemed appropriate. Jeff and I (Brian) also tend to feel a little blue during those colder, shorter days of the year, and the company of the band really helped cure that depression. In all, we thought “Cold Weather Company” really represented us--both in our sound and in the way we write. Are there any projects that you’re currently working on? As soon as we finalized our first album, “Somewhere New,” we began work on our second project. We have a number of new songs that are in various stages of completion right now, and we’ve started playing some of them at our shows. I think one of our strengths is that all three of us are songwriters, so we’re never short on ideas. We actually have trouble finding enough time to write sometimes, and we’re constantly sending each other short recordings of new melodies and riffs. While we don’t have a target date yet for the next project, we’re planning on getting back into the recording process as soon as we can. Image of Cold Weather Company performing a live rooftop session for Streamline Cinema GardenTakes. Describe your creative process, is there a particular way the three of you write together? We don’t really have a standard strategy when it comes to songwriting. We each have our own little ways of writing that work best for us. Generally speaking, one of us will come up with a new idea, and we’ll work on it until a song starts to take shape. From there, we discuss what the song feels like its trying to say--we try to get a meaning from the melody. Most of the time, lyrics are written by whoever connects most with the song, and then the words are revised by the three of us. Every now and then, though, one of us will write a song completely on his own, and then it’s just a matter of writing the other instrumental parts and vocal harmonies. I (Brian) personally like that we don’t have a set form of writing, as it keeps the process spontaneous. I really think songwriting happens best when it isn’t bound by a strategy or formula. What has been the most rewarding project/experience that you’ve had yet? I think that would have to be the “Cold Weather Coat Drive”. As soon as we finalized the dates for our release shows on the weekend of January 22nd, 2015, we knew we wanted to use those shows to give back to the community in whatever way we could. We decided we would run a coat drive, where each person who donated a coat at one of our shows would receive a copy of “Somewhere New” in exchange. 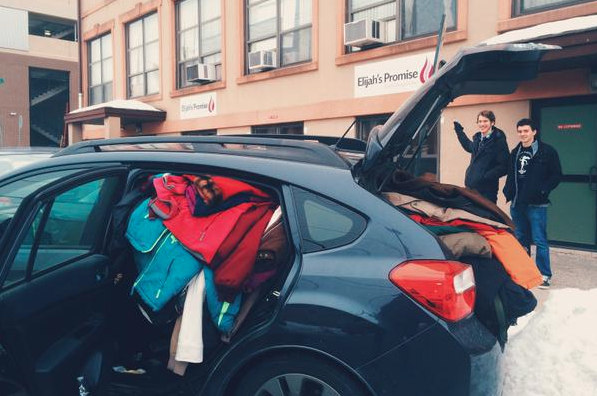 At the end of release weekend, we had collected 36 coats, all of which we donated to Elijah’s Promise, an organization in New Brunswick, NJ that provides those in need with food, clothing, and shelter. Seeing so many people not only care for the music we made, but also for the community in which we live, was incredible, and we’ll be trying to work in more ideas like the coat drive every chance we get. Above is an image by Brian of Steve and Jeff, donating 36 coats to Elijah’s Promise. through their Cold Weather Coat Drive. Brian: I’m influenced mostly by singer/songwriter types--music that makes you “feel” something. Some of my favorite artists are Fleet Foxes, Bon Iver, Brett Dennen, Iron and Wine, and Radical Face. Jeff: I’d have to say I’m influenced most by Dave Matthews Band, The Decemberists, Tallest Man on Earth, and Radiohead. Steve: For me it’s always been a lot of piano-based bands like Keane and Coldplay as well as indie rock like Two Door Cinema Club, along with a lot of singer/songwriters like Matt Corby and James Vincent McMorrow. We tend to find inspiration largely in our environment and the nature that surrounds us. It seems, like many songwriters, our most important songwriting comes from times where things are uncertain or unclear. Many of my (Steve) songs from Somewhere New follow the same story about a particular falling out, and I found it easiest to describe that all through music. I’ve only been writing songs with lyrics for a bit less than three years, but they all came from important events or series of events. Nature tends to be a big inspiration because there are always parts of it to explore and learn new things from, it’s always changing and, while I don’t know as much about it as our resident Landscape Architect (Brian), relating our songs to nature allows us to more fully explain our thoughts and concepts. What is your local city and what are your recommendations for that city? Steve: Our local city is New Brunswick, Jeff and I go to school at Rutgers University and Brian graduated from there a few years ago. I’d say some of the best areas are the local theaters, like the State Theater, which always have a lot of cool shows going on. While I don’t drink coffee, Hidden Grounds is one of the coolest little coffee shops I know of, so that’s a nice place to hang out! As for recommendations, I’m not sure what to say. I think New Brunswick has been on a great path over the last few years, and I can really see it slowly becoming the “Hub City” it’s always been known as. To follow Cold Weather Company and their story you can visit their site or follow them on Instagram. You can also listen to their album Somewhere New here. Check out the videos below of the guys performing a live session for Streamline Cinema’s GardenTakes!